Dr. O’Hara is often referred to as the “gentle dentist” and has been practicing dentistry for over 29 years. He attended Lubbock Christian University from 1979 to 1983 and graduated from the University of Texas Health Sciences Center in San Antonio, TX in 1987. Upon graduating dental school, he served in the United State Navy from 1987 to 1991. 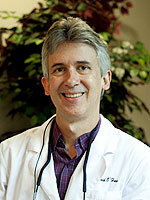 Dr. O’Hara began his private practice in Abernathy in 1991. In 1998 he opened a second office in Lubbock which has become his permanent home. Many of his patient travel from Abernathy and continue to receive the same gentle, compassionate care they have enjoyed since 1991. Dr. O’Hara and his wife, Anita, have five children and five grandchildren. In his spare time he enjoys spending time with his family and friends. He also has a strong passion for music, playing his guitar and singing.